and no one who is not let in by the gate can know the beauty and wealth of the palace that, with its ancestral temple and hundred ministrants, lies hidden within. But it must be admitted that those who are let in by the gate are few." This means that Confucius' knowledge and morals are very deep. There is no short cut of learning. Those who wish to learn must go through the Hongmen Gate or the Pangon Gate (which are both ancient institutions of learning) and study with all-out effort. The four characters "Wan Ren Gon Qiang" are written on the outside wall of the temple and a Chinese unicorn was painted inside. According to legend, the Chinese unicorn is a gentle beast, and heralds the birth of a talented son. In the old days, the Chinese unicorn was painted not only on the Wanren Gongqiang of Confucius temples, but also on the walls immediately outside the front doors of other temples or government offices. From this one can see that the painting of Chinese unicorns has a long and well established tradition. The Pan Pond is in the shape of a half moon and is located behind the Wan Ren Gon Wall. 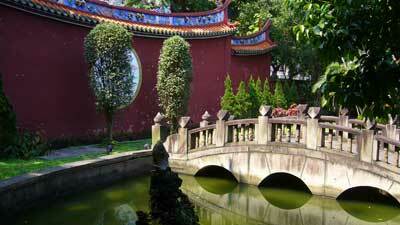 Half-moon shaped ponds were often placed in front of houses or temples in ancient times. It was believed that such ponds could prevent disasters as well as reduce the summer heat and constitute good geomancy. In addition, "Pan Pond" also means "the water of Pangon Gate", or, "the pond of the school".